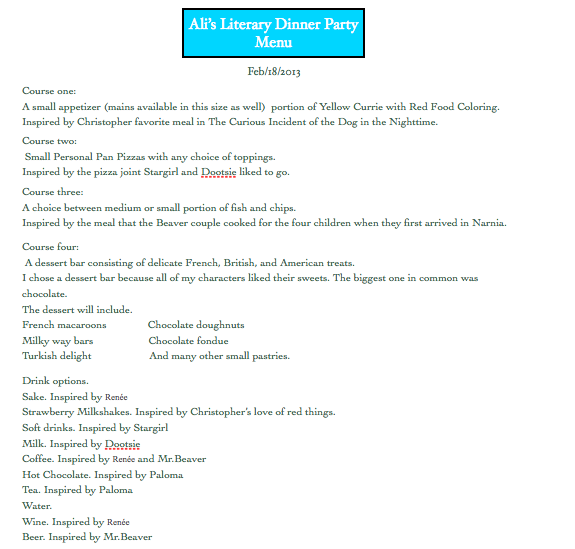 For my second litspiration challenge is decided to do a literary dinner party. This would be my invitation because it is simple and straight forward. I chose a simpler invitation because I think that the elegant people would appreciate it and the other simpler characters would like the cartoon. I chose to have my dinner party in London because many of my characters are from Europe so I think that it would be cool to see some of them in their normal element. Also I really like the city so I think it would make a cool location. These are the books which all my characters will be from. Christopher John Francis Boone. From The Curious Incident of the Dog in the Nighttime. I would want to invite Christopher because I would really want to see what he looks like because of his Aspergers Syndrome he didn’t describe how people looked. I think he would be a really interesting dinner guest because of his desires and his experiences with the dead dog and his parents. I don’t think he would stay very long and I think that he would be really quite during dinner but I think he would take comfort in the food offered because he loves red things but hates yellow, and brown. I don’t think he would be very talkative but I think would make him a good dinner guest. Paloma. From From The Elegance of the Hedgehog. I would invite Paloma to dinner because I would really want to meet the person who inspired me to look at the world in a different way. And I think she would create really good dinner conversation. I think he and I could have a great conversation. I think that she wouldn’t get along with Christopher because she would be trying to analyze him, but I do think she would get along with Stargirl because they both are so unique compared to many of the other people in the world. I think she might also be interested in Lucy from The Lion, the Witch and the Wardrobe because she would be interested of the fantasy of her tale. Renée. From The Elegance of the Hedgehog. I think I would invite Madam Michelle because like Paloma she has a really different way of thinking. I think she would get along or be interested with Stargirl’s neighbor because she would be interested in why she stayed in her home the whole time. I think she would kind of ask christopher questions but I think she might be able to help because she reads so many phycological books. I think her and Paloma would make the dinner very elegant. Lucy. The Lion, the Witch and the Wardrobe. I think I would want to invite Lucy because she has such an amazing imagination and in the book she I think is the main character. I think her and Dootsie from Stargirl would get along because they both have really good imaginations. I think Lucy would make dinner really uplifting and proper because of the way she was raised. Aslan. The Lion, the Witch and the Wardrobe. I would want Aslan there because first of all who wouldn’t want a LION at their party!!!! But I think it would be really interesting because he is so courages and is very sophisticated and I think that would balance out the characters from the other books who are a lot simpler. I think he and Renée would be really interested in him because they are both so interesting from different aspects. The Beaver couple. The Lion, the Witch and the Wardrobe. I think the Beaver couple would be good dinner guests because Mrs.Beaver would be very warm and welcoming and Mr.Beaver would be very manly but in the sense of the 1800s very classical. I think that Mr.Beaver would be talking to Aslan alot because he seems like the only person he would be compatible with. I think Mrs.Beaver would get along with Renée because they are both classy ladies. StarGirl. From Stargirl and Love Stargirl. I think Stargirl would be a cool dinner guest because she is really easy going and exciting. I think that I would want to meet her because I think I can somehow connect with her. I think that she would really like Paloma and try to interact with Christopher. I think that she would also like Mrs.Beaver because they are both bubbly in their own ways. I think that Leo would be a cool dinner guest because he would be really simple and easy going which would help level out the amount of intenseness of my other guests and he would just be a normal person. I think that he and Dootsie would get along because they both love Stargirl. I think that he would be really focused on Stargirl because of the fact she moved away. I think it would be cool to see their reunion. I think it would be really cool to meet dootsie because she is so fun loving and easy going. I think she would add a lot of humor to the dinner table because of how young and un-shy she is. I think she would absolutely love meeting Aslain, The Beavers, Paloma, and Leo. I think she would be very entertained by the animal characters, and really excited to meet the Leo that Stargirl has talked so much about. I think she would like Paloma because she would be confused why she is so serious because her older friend is so light headed and bubbly not as fancy. I think I would really want to meet the SFJSFJ from Stargirl because Stargirl, and Dootsie got her out of her house for the first time in many years. I think she and Renée would have a good conversation because Madam would be interested on how she left her home. I think she would add a sense comfortable ness to the environment. I think she would be kind of scared of the animal characters because she is still working on leaving her house. Hope Everyone can come ;) Hope you all liked this!! Ali, I think that this litsperation is the coolest thing ever! I think that you described everything so greatly, and I love how you included so many pictures. It looks very good. I really like those books that you took the characters from to invite, however, I didn't read the Curious Incident of the Dog in the Nighttime and The Elegance of a Hedgehog, but they seem to have interesting characters. Goo job Ali!!!!!!!! I really enjoyed reading your litspiration challenge. I thought that your choices were very straightforward and clear. I would not really want an ordinary Lion at my part, but if it is Aslan then sure why not. Your explanation of the characters made me want to get to know them in person, because of their likeable personalities and characteristics. Keep up the good work! Ali, would you ever attempt to really make any of the food on your menu? What if you actually held a real dinner party like this? I would definitely come! Ali, this is an amazing litspiration challenge! The thing that especially made me very impressed was the fact that you talked about how you thought the different characters would compliment and interact with each other. The menu and invitations, as well as the explanation about them, proves that you spent a lot of effort on this challenge. The pictures were also really cool -- It made the post more visually appealing and broke up the text well. Why did you choose to pick characters from those specific books? Is it because you recently read them, or simply because they all had very interesting characters? Judging from the books you read and the characters chosen, I am thinking you like kind-of quirky characters. :) Is this true? I love your blog theme-- Simple yet artistic and pretty. I also found that the book trailer and how to be like Stargirl post was very interesting. How did you come across those things? They were really awesome! Oh my gosh! This is amazing. Even better than mine. Why did you choose those specific characters? This is so you and I really love it. I love your blog, it reminds me so much of you! Ali, you've obviously put in a lot of time, effort and imagination into the blog. So interesting to see how you come up with the details and thoughts around this project. Great job!! !